“This is the ancient land, where wisdom made its home before it went into any other country… Here is the same India whose soil has been trodden by the feet of the greatest sages that ever lived… Look back, therefore, as far as you can, drink deep of the eternal fountains that are behind, and after that look forward, march forward, and make India brighter, greater, much higher, than she ever was.” Sri Swami Vivekananda. 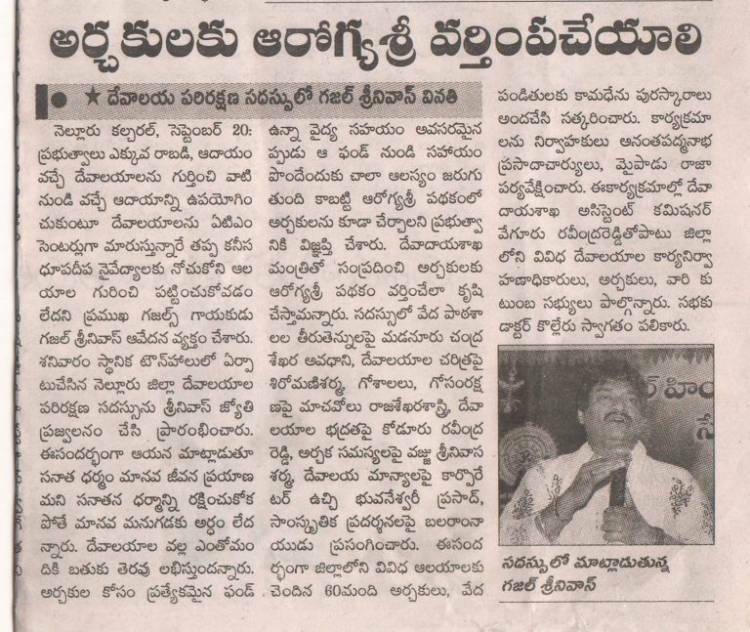 Dr. Ghazal Srinivas, Brand Ambassador for Global Hindu Heritage Foundation and SaveTemples has organized a timely and appropriate Symposium on the Protection of Hindu Temples and demanded that the government should repeal the Endowment Act and handover the management of the Temples to Acharya Sabha. He mentioned that government has no moral or ethical reason to take over these Temples lands that were donated by our forefathers to make sure that the Temples are maintained and the Priests are properly paid and all the festivals are done as per our scriptures. On behalf of GHHF and SaveTemples, he made the following recommendations to the government to ensure that the Hindu Temples are properly maintained as per our scriptures. GHHF, Swami Paripoornanada and Dr. Srinivas were advocating the protection of Hindu Temples, Protection of Cows and welfare schemes for the Priests. 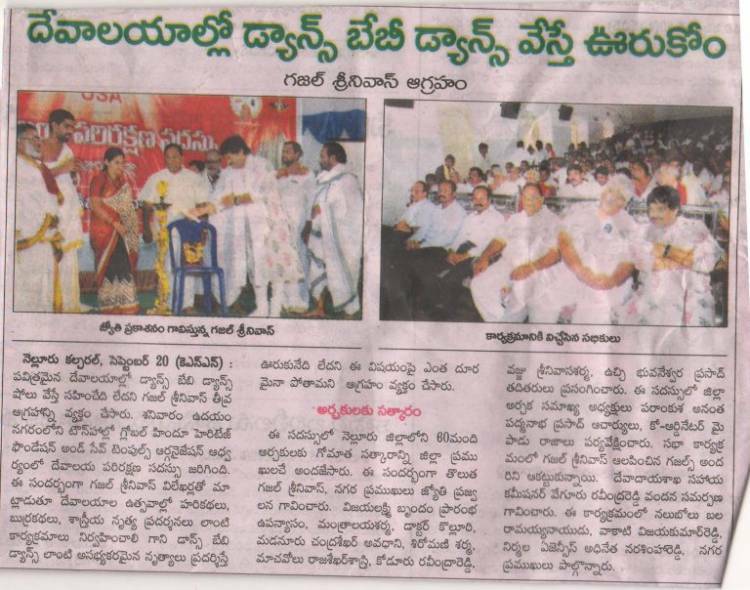 This Symposium is being conducted first in Nellore and hope to repeat it in other cities. 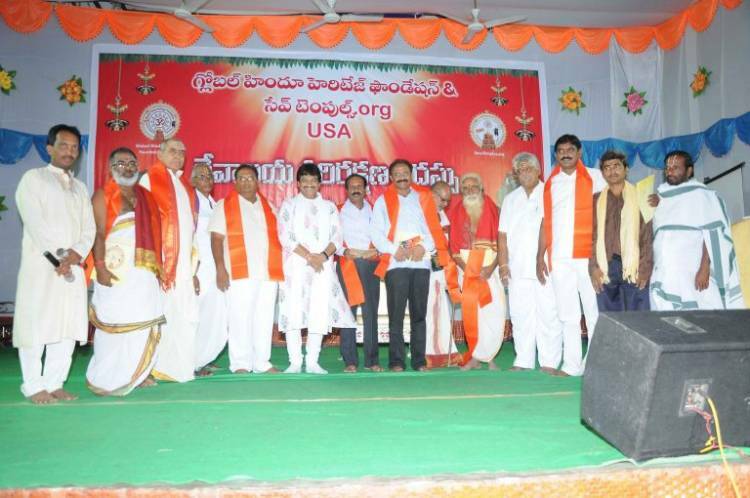 All the priests are given “White” cards and NTR Arogyasree scheme privileges are awarded to all of them. They are living substandard life as their salaries are so meager they cannot even food two times a day. In August, Dr. Srinivas has organized International Short Film Festival in Hyderabad. They have selected 40 films from 140 GHHF received and showed in Prasad Labs. Response was overwhelming and beyond our expectations. He announced some of these 40 films would be shown across the state and abroad to make aware of the rich dimensions of Hindu Temples and Gomata. Numerous problems that we are facing to day because of our negligence in treating the Gomata in a proper way. They are being send to slaughterhouses and committing grave sin by not protecting them. Many scientific studies have shown that the products of Gomata provide much needed health. Its urine is patented as medicine to treat cancer patients. Milk is as good as mother’s milk providing sustenance for the humanity. Cow-dung absorbs the dangerous radiation much faster then any substance. We will take stand against “Dance Baby Dance” type dances being conducted in Temples. We are opposed to these kind of sensate dances since they are inappropriate in sacred places. 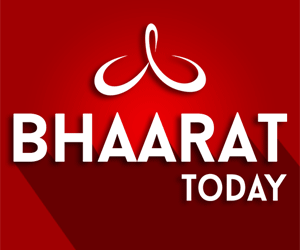 All Temples should promote Religious activities, Burrakathas, Harikathas, Classical Bharata Natyam, Kuchipudi dances and similar traditional cultural programs. Sanatana Dharma is a blue print for all stages of life that describe the responsibilities respectively. He lamented on the nails pace help rendered to the priests by the government although the Fund is establishes. It is not being used to help them. He emphasized the need to develop mechanism to wrote the history of all the Temples, make arrangements to inform the pilgrims before they visit the Temples, pay attention to the needs of the pilgrims and renovate all the Temples that are in need of repairs. Thousands of NRIs are involved in this movement to preserve, promote and protect the Hindu Temples. 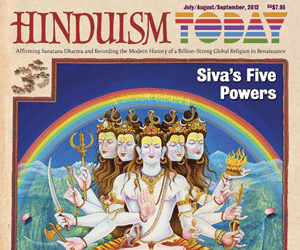 GHHF was started in 2006 and they have been advocating the need to repeal the Endowment Act and handover the Hindu Temples to Hindus themselves. Nellore: Global Hindu Heritage Foundation and Save Temples Organisation advised the government to bring endowments lands and other assets under the control of Seers of Holy Peetams to prevent misuse of temple properties. Functionary of the foundation and Ghazal exponent, Dr Ghazal Srinivas, made this observation while reminding that government does not have any say in the properties belonging to churches and mosques. Addressing large number of temple priests during Archakas’ Convention held at Town Hall here on Saturday, the Triple Guinness World Record Holder appealed the government to extend NTR Arogya Sree scheme to Archakas. He also suggested that the government hand over the management of temples with less than Rs 2 lakh revenue to the priests working in such temples. 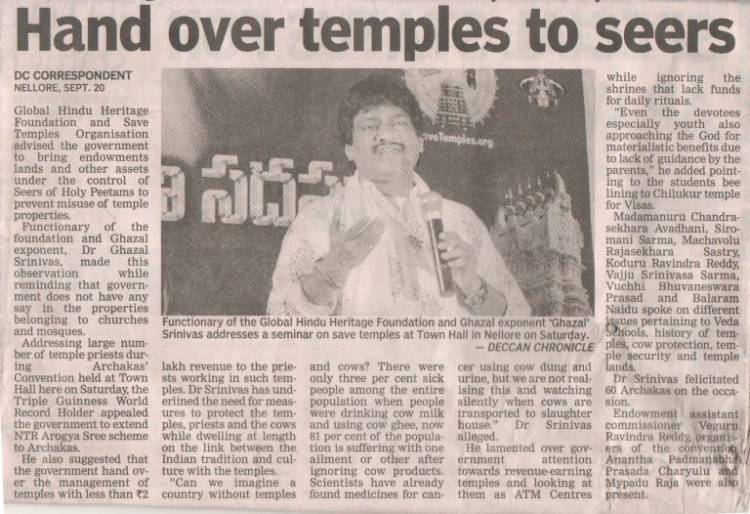 Dr Srinivas has underlined the need for measures to protect the temples, priests and the cows while dwelling at length on the link between the Indian tradition and culture with the temples. “Can we imagine a country without temples and cows? There were only three per cent sick people among the entire population when people were drinking cow milk and using cow ghee, now 81 per cent of the population is suffering with one ailment or other after ignoring cow products. Scientists have already found medicines for cancer using cow dung and urine, but we are not realising this and watching silently when cows are transported to slaughter house.” Dr Srinivas alleged. He lamented over government attention towards revenue-earning temples and looking at them as ATM Centres while ignoring the shrines that lack funds for daily rituals. “Even the devotees especially youth also approaching the God for materialistic benefits due to lack of guidance by the parents,” he added pointing to the students bee lining to Chilukur temple for Visas. Madamanuru Chandra-sekhara Avadhani, Siromani Sarma, Machavolu Rajasekhara Sastry, Koduru Ravindra Reddy, Vajjala Srinivasa Sarma, Vuchhi Bhuvaneswara Prasad and Balaram Naidu spoke on different issues pertaining to Veda Schools, history of temples, cow protection, temple security and temple lands. Dr Srinivas felicitated 60 Archakas on the occasion. Endowment assistant commissioner Veguru Ravindra Reddy, organisers of the convention Anantha Padmanabha Prasada Charyulu and Mypadu Raja were also present.